Use this curriculum and you will see less scenes like this in the classroom. DOES: Teaches storytelling and writing alongside Common Core Standards- dream curriculum!!!! GIVEAWAY PRIZE: One extremely lucky winner will win both the StoryStarter Set and StoryVisualizer Program and Curriculum. Value $238!!!!! How do you get your news and other information that you need to do what you need to do? Email? TV? Radio? Perhaps those are the methods of yesterday. Now we have webinars, infographics, podcasts, facebook, and pinterest. To be sure, this list is never-ending as well as ever-changing. However, as varied as this media is, there is one common goal. That is, whatever information is provided, it is provided with one primary objective: to be understood. Students will build using 1,144 carefully selected pieces to tell their stories. When children start writing in school, it seems as if they are being asked not so much as to be understood but rather it is kind of like a show-you-know-it format ie. write a sentence using the word "their"
explain how a chemical change can happen to a potato, explain how you know that it is a chemical change. one method, then, well, that's it. No credit. Zero. Want to try out the software... for free? Click HERE and experience StoryVisualizer! Do you feel this way about people who haven't taken to Facebook? As if you have to enter another dimension to connect with them? But if you really want to, you do it, don't you? Some of my friends prefer the phone, texting, email, facebook... everyone's different. I love watching him work and being excited and feeling confident. As you all expect superior quality reviews, I did make a special effort to have a certified Special Education teacher who is also my son's tutor use this as part of her teaching plan with my son. I asked Annie about the program's strengths. She divided them into three parts. 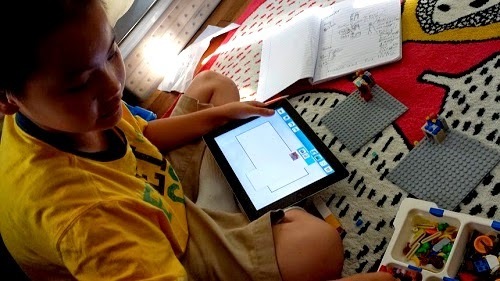 Each lesson is centered around standards and goals which saves the teacher so much time! Each lesson comes with a set of questions and script that is to be read to the child. Each script is fun and general enough for any student of any age to add their own twist to the story. Teachers are able to modify the script depending on the child's background knowledge and interests. Hey man, they have dogs, arrows, food, plates, so many different hats. It's like a pretend play closet but not as smelly and messy. All the lessons have the POV component intertwined with other various goals. I find this goal to be one of the most important, because I find it to be a great segue way into a rich conversation on diverse perspectives of certain characters that are in their stories. Feelings is another theme that comes up over and over again in our conversations. The questions on feelings are included in the script for teachers who need more guidance in that department. By talking about characters' feelings beforehand, my students was able to include that into his writing in the StoryVisualizer. Since they are generating their own stories, they have to keep track of the who, what, when, where. Once finished with building, my student was excited to share his story full of twists and turns and dramatic endings. Once he was finished talking about, we would go through a checklist of all the first four W's and revisit the how and the why towards the end (I purposely do this so I don't interrupt of his storytelling flow). Keeping this in the routine helped him to include all these components during the planning stage so when it was time to talk about this story, the story was full with details and content. Okay Annie, there must have been some surprises. Anything unexpected? I was surprised at how easy this was! 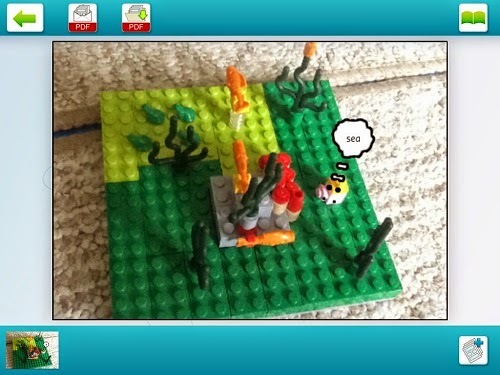 After the first lesson, my student was willing to take ownership of his lessons and be more independent on taking pictures of his creation and adding that to the StoryVisualizer. Of course, it wasn't smooth sailing from the beginning, but with plenty of modeling, after the first three lessons, he was running the show! What do you call those sharp swerve marks? I like to call them adverbs. The point is to teach kids how to tell a good story. First he showed movement on the page and then he was able to use the term "dashing around" in the sentence. What was still hard for your student with the new approach? How? Time management is always tricky. It was easy for my student to get carried away with building. The more he built, the more intricate and complex his story became, but I would remind him that managing our time well with an assignment was also one of his goals. To practice this skill, we both agreed on how much time would be spent on building and on writing. Typing out the sentences on an ipad is not the easiest task. (Jenn's note: they used an iPad2 but you can use more updated versions or even your Android or computer) An ipad can be very sensitive to slight touches, so my student would accidentally delete pictures and long sentences that he had written. This would cause moments of frustration. If there was a voice recognizer within the software, I think students would be be far more successful in getting their thoughts out into the StoryVisualizer. Do you think a non-teacher can make sense of the curriculum? What could be included to make it better? For the less-experienced teachers, there could be more challenging questions and scenarios included in the script as a side note. It seemed as though the scripts were created for younger children. The older grades can be pushed a bit farther with more sticky situations and harder point-of-view questions. the StoryVisualizer Program and Curriculum Pack (thick binder of curriculum information that is also available for download by your colleagues at school. 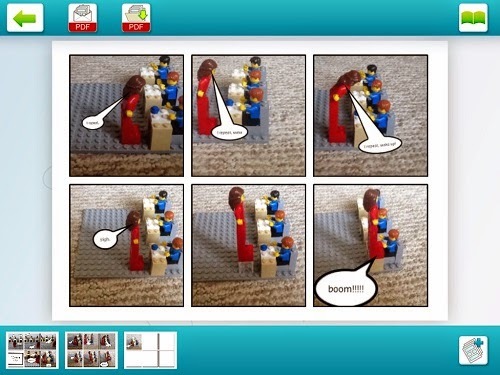 LEGO says OK to multiple downloads by your institution! SAVE MONEY! I love those big square plates. It can be used to show beginning, middle, and end. I love the dividing trays. Did you know that famous storytellers like Anne Rice and Steven Spielberg are dyslexic? If you find that hard to believe, listen to a story that young Mollie has created. 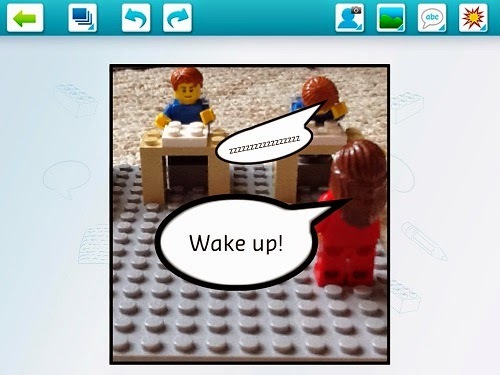 According to this video from LEGO Education, Mollie struggled with literacy but with help from StoryStarter, she's made awesome progress. Go Mollie! USE Rafflecopter to Enter This Amazing Contest to Win A Your Very Own SET, Curriculum Pack, and Software!!!!! More fun ways to win! Find out about the A Pigeon Builds a Story Contest! We homeschool and we teach by reading lots of books and engaging it pretend play and small world play for storytelling. But we also use games to practice storytelling. 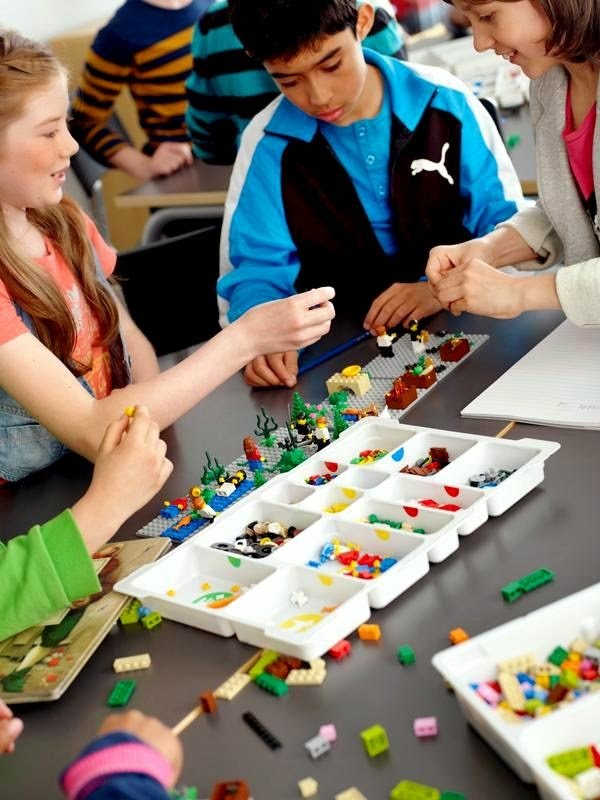 I love Lego Education's collection of products and appreciate that they have an area for homeschooling families. Our school district has moved away from fiction writing to non-fiction but my son's teacher for 1st and 2nd grade allowed the kids to continue fiction writing as long as their other work was done. She commented some of the best writing came from their non-fiction. When they were learning about the westward expansion she made little journals for each student and had them write as if they were part of a family heading out west. They added details from what they learned but also were able to take off and come up with some creative stories. I loved that assignment! this is awesome! 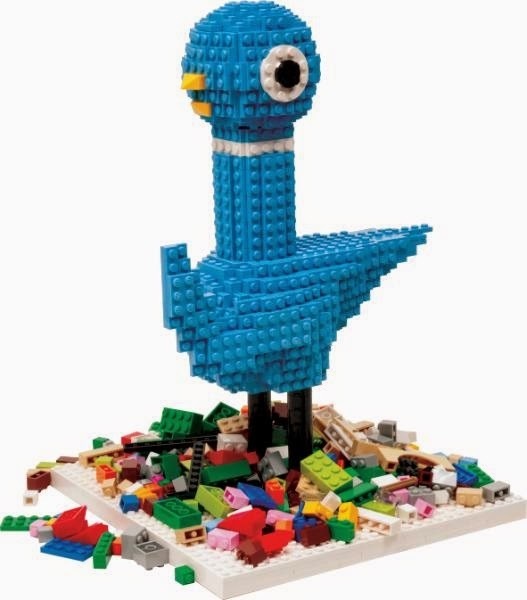 I love how legos can become anything- even Mo Willem's Pigeon gets a visit. We take turns writing and telling stories. It can get pretty funny. 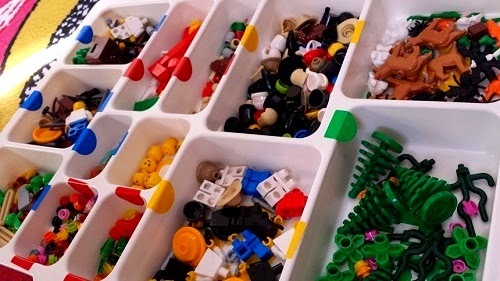 This is such an awesome idea - I also love the Lego Education WeDo Construction set - what a fun way to be introduced to more complex math and science concepts. My now school is play-based and integrates writing throughout different activities so that children are able to practice reading and writing throughout their day and at their own pace. Which is much better than when I did public school and my Kindergartners were required to write 8 sentences by December! Thanks for this outstanding post. I would really appreciate it.